A 26-year-old hero was given a stern talking-to for driving this righteous motorized cooler around a mall parking lot. Later on, cops caught him again whipping the thing around city streets and charged him with "driving unlicensed, and driving an unregistered and uninsured vehicle." 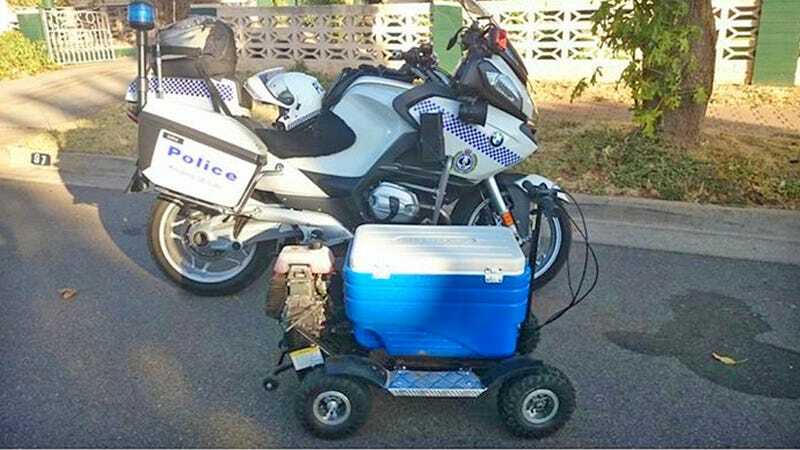 The South Australia Police report "the esky [Aussie for "cooler"] is a novelty import and cannot be legally registered in South Australia and cannot be driven on roads – information which is clearly displayed on the esky." Just make sure to read and abide by all the rules printed on your ice chest before you go strapping an engine to it and raising a ruckus or the cops are gonna have words with ya. That said, I'm pretty sure this is one of the best vehicles I've ever seen.